DO YOU WANT TO BE PROFICIENT IN PLAYING THE CLASSICAL STYLE OF DRAUGHTS GAME? This 561 pages E-Book (See Sample Pages Here) which is divided into 3 parts of 187 pages each. 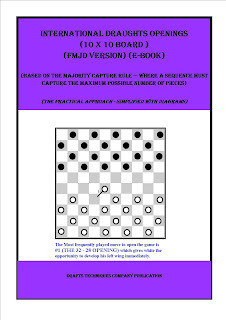 Its aim, is to teach players various lessons to enable them MASTER THE STYLE OF DRAUGHTS GAME CALLED "CLASSICAL GAMES" to have a solid foundation that eventually graduate to more advance techniques of Draughts using the system called "The Synergy of the Defence Formation and The Attack Line Games" by comprehensively examining various topics as presented by a Draughts Champion. This Free E-Book reviews the original work with randomly selected excerpts from the work. (See Preview of the Free E-book Here). Good job. You must have put in a lot to achieve this. Please keep up the good work!! We thank you for your enquiry. Unfortunately, we do not know of any other Nigerian draughts game site where you can download Nigerian draughts game at the moment. We are however, in talks with some draughts game developers to see how this can be done for us. Thank you. You could reach us by email: info@draftstechniques.com. It's truly very complex in this active life to listen news on TV, thus I only use the web for that purpose, and take the most up-to-date news. We appreciate your desire to get some tips about blogging when we update our website. Kindly send a mail to: info@draftstechniques.com. A member of our team might be able to assist you on some aspects of blogging. We cannot thank you enough for your feedback. Feedback about our post(s) are what keeps us striving to do more and feel appreciated. Best wishes to you from all of us here. We are so grateful for your compliments! Hi! Thanks for wanting to subscribe to our posts. There are two ways to subscribe to our posts. On the Home page, just below the Heading, you will see a "Subscribe" button. Just click on it and put in your e-mail address and press the "Get email notification" button to send. This will enable you to receive notifications on our subsequent posts. The other way is to simply "Follow by Email". This form is on the left hand side of the home page. Simply fill in your email address and click "Get email notification" to send. This will enable you to receive emails from us anytime we send out new posts. We thank you so much for your compliments. Hi there colleagues, its impressive paragraph on the topic of educationand entirely explained, keep it up all the time. Thanks for your feedback. Please keep them coming! !